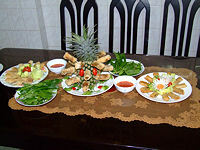 We are pleased to offer this half-day course in the art of preparing Vietnamese food. 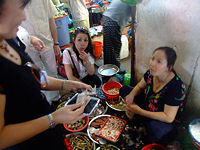 Unusually, the course takes place in the home of one of our instructors, and gives an insight not only into the cooking, but into the lives of ordinary Vietnamese people. Students from a local college (keen to practise their English!) will meet you at your hotel, and take you to meet the course instructor, then carry on to the local market to buy the necessary ingredients. Afterwards, you will go the the home of the instructor, where you will assist in the preparation of the food. Finally, you get to enjoy the lunch you helped prepare! Please note this course is only available as part of a complete holiday itinerary. Please note that, whilst every effort will be made to carry out the programme, small changes may sometimes be necessary.